Today HP is introducing the HP ProBook 445 G6 and HP ProBook 455 G6 PCs designed for growing businesses and mobile professionals. Dubai, UAE, January 27, 2019: SMBs have a passion for business, so having technology that helps them save time, make money and make their business stronger, is paramount. They also seek value, not just the lowest price. When it comes to a great business notebook, they want one that includes everything required to get the job done both in and outside the office – from modern design, performance and long battery life, to enterprise-grade security and connectivity. Powered by Windows 10 and advanced AMD Ryzen™ quad-core processors, the HP ProBook 445 G6 and HP ProBook 455 G6 PCs are designed for today’s workforce and help keep professionals productive in the office and on the go with the power, style and value that growing businesses need. Stylish design for every business. Features ultra-slim chassis with crisp lines, clean edges, and a natural silver finish. Near borderless displays provide an optimal viewing experience, and 180° hinge allows users to lay the device flat making it easier to share content and collaborate. Secure and manageable business features. Enhanced with a range of security features including the HP BIOSphere Gen4 firmware ecosystem that automates the BIOS protection and enables easy manageability. Features durable chassis with a 3D forged aluminum keyboard deck and stamped aluminum top cover. Built with connectivity options that can be tailored to user needs including the HP Connection Optimizer self-healing wireless driver technology. Powerful processing. Available with advanced AMD Ryzen™ quad-core processors and long battery life to get through deadline-driven, multi-tasking days. Quickly recharge the PCs and get up to 50% battery life with HP Fast Charge. 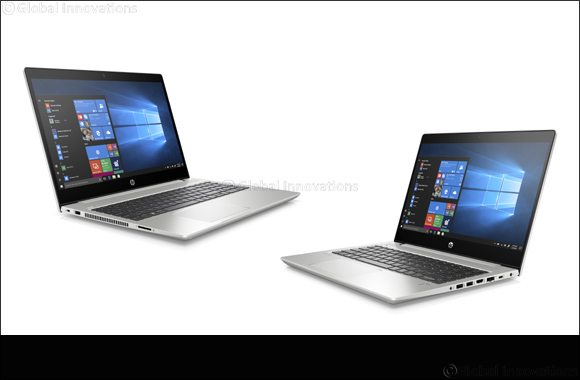 The HP ProBook 445 G6 and ProBook 455 G6 will be available in EMEA in February starting at €449*.